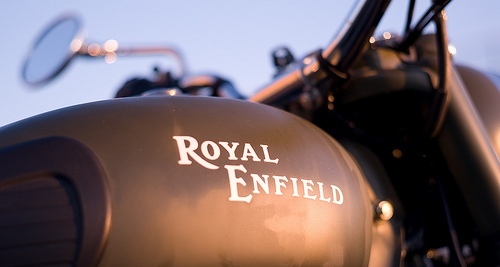 Preparing Your Royal Enfield Motorcycle For Winter !! OK I guess I have to give it up. It is so cold here today that I can’t put off the topic of winterization another day. Here are some tips that I’ve picked up over the years for properly storing your bike for the winter. 1. When you put the bike away, put it away clean and well fed so that in the spring it is ready to go. 3. Inflate the tyres properly. 4. Change the primary fluid in the bike if you are close to the correct time. 5. Most importantly, change the engine oil and filter. Why would you want that old dirty oil in the engine all winter just looking for ways to corrode parts. 6. If it is tune up time, do it before you put it away, adjust the vales, replace the plug and set the timing (if it is an iron barrel engine). 7. If you have any repairs, it’s a good idea to make them now rather than putting them off until spring. You’ll thank yourself later. 8. Fill the tank with fresh gas and use some Sta-bil in the tank. As I understand it, it is a polymer that floats on the surface of the fuel to keep the air from attaching to it and making it go bad. 9. It is critical that you run the engine and turn off the petrol tap until the carburetor runs out of fuel. Sta-bil will not prevent gumming of the carburetor jets, but a dry carburetor is a happy carburetor over the winter. 10. Now this is a piece of advice we hope you don’t take so that we can sell you a battery in the spring: Either remove the battery or leave it in and put an automatic Battery Tender on it. You can at least double the life of your battery with this simple step. Leave it on all winter checking the water level occasionally. Do not use a trickle charger which is on all of the time as it will boil your battery dry over a period of time. If you do this, your bike will be ready to fire up on the first nice day. 11. Cover the bike with a cover that will breath and allow some air circulation. Only store your bike outside as a last resort. If you have to do this make sure that the cover is waterproof. This ounce of prevention will make a big difference in the life of your bike. Spending just an hour or less now will save you several hours or even days come spring, when everyone else is riding! Really nice post!! By the way i am from Mumbai, we hardly have any cold climate even in winter. But just out of curiosity wanted to know what is the operating temperature for a Royal Enfield Max temperature and Minimum Temperature??? ?